The project was informed by over six years of work by Walinsky as lead artist at the Mural Arts Southeast by Southeast community hub in South Philadelphia, in collaboration with Mural Arts Philadelphia, the Department of Behavioral Health and Intellectual disAbility Services, and members of the Bhutanese, Burmese, Nepalese, and other immigrant and refugee communities. For Free Speech, Walinsky collaborated with numerous Southeast by Southeast artists, including Sanctuary Poets, Catzie Vilayphonh of Laos in the House, Laura Deutch of PhillyCAM, Ma Kay Saw, Krishna Tamang, Noor Azizah, and Mayyadah Alhumssi. Partners: City of Philadelphia, Philadelphia Parks & Recreation, Friends of Marconi Plaza, Department of Behavioral Health and Intellectual disAbility Services, Furness High School, Northeast High School, and Migrant Education. Free Speech was presented as a part of the Monument Lab: Philadelphia (2017) exhibition. A small business is often the first big step many new immigrant and refugee families take in beginning their lives in the US. Free Speech is a metaphor for that first step, a symbol of why so many risk their lives to come to the US. 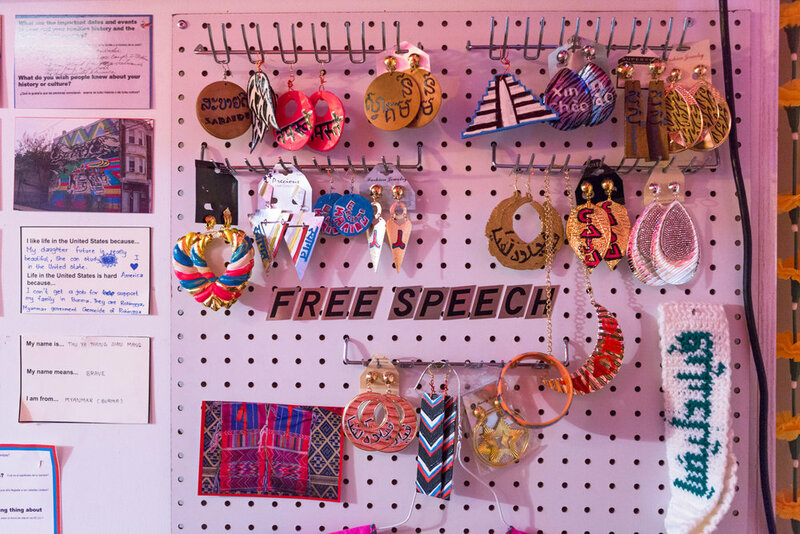 Free Speech is a news kiosk filled with artwork and writing, created over the past six years with Southeast by Southeast—a converted storefront space dedicated to the needs of new refugee families. The newsstand and its materials celebrate refugee and immigrant stories, and feature the artwork of members of the refugee and immigrant communities. Highlighted work includes books made in collaboration with students and teachers, and videos created with students. Collaborations with other artists are in the exhibit and part of an event series. Shira Walinsky is a multi-disciplinary artist and teacher who has worked with communities throughout Philadelphia. 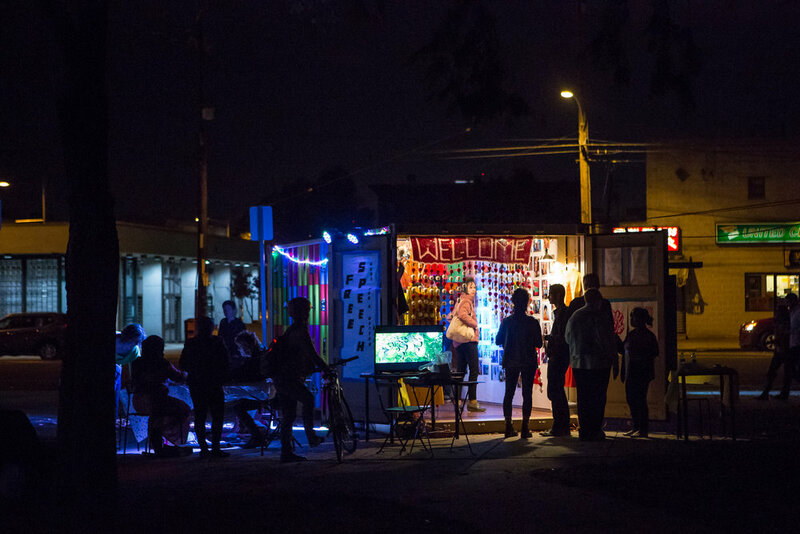 Her projects are grassroots community projects that work with underutilized spaces in the city. She is compelled by the personal story and modes of representations from the painted portrait to the documentary. Her murals can be seen throughout the city of Philadelphia. In 2012, Walinsky co- founded by Southeast by Southeast through Mural Arts Philadelphia. Southeast by Southeast is a community center for new refugees from Burma and Bhutan in South Philadelphia. Southeast by Southeast has been presented at the North American Refugee Health conference in Rochester, NY. Her work has also been shown at PAFA, Asian Arts Initiative, and the ICA Philadelphia. She is currently working on a series of short films about the Burmese and Bhutanese refugee experience in Philadelphia with teens in South Philadelphia.